In early July 1918, Burlington Mayor J. Holmes Jackson assembled a committee to plan a Bastille Day celebration. The Burlington Free Press reported the committee’s plans in detail and encouraged everyone to participate. Photographer L.L. McAllister was on hand to document the crowd with his panoramic camera. According to the Free Press, the committee believed Burlington should recognize Bastille Day for a number of reasons, including the region’s association with French history, the many Burlington citizens with French heritage, and the memories of French General Lafayette’s visit to the city in June 1825. Most importantly, the committee wanted to pay tribute to France for its “defense of freedom and civilization” during the long years of World War 1. The celebration started with musical exercises in City Hall Park. Following a short concert by Sherman’s band, community members sang French and American patriotic songs. It has been estimated that McAllister’s photograph of the crowd gathered in City Hall Park shows 1400-1500 people. Only the central portion of the 40.5 inch-long panorama is shown above. Sherman’s band is visible in the bandstand behind the crowd. Then a procession marched up College Street to UVM’s College Green to lay flowers–from field and garden–at the base of the Lafayette memorial in front of the University of Vermont’s Old Mill building. Women holding flowers for the tribute can be seen at either side of the McAllister photo. A chorus sang French and American songs as the procession passed the monument. To learn more about the L. L. McAllister Collection, view the finding aid or browse the digital collection. 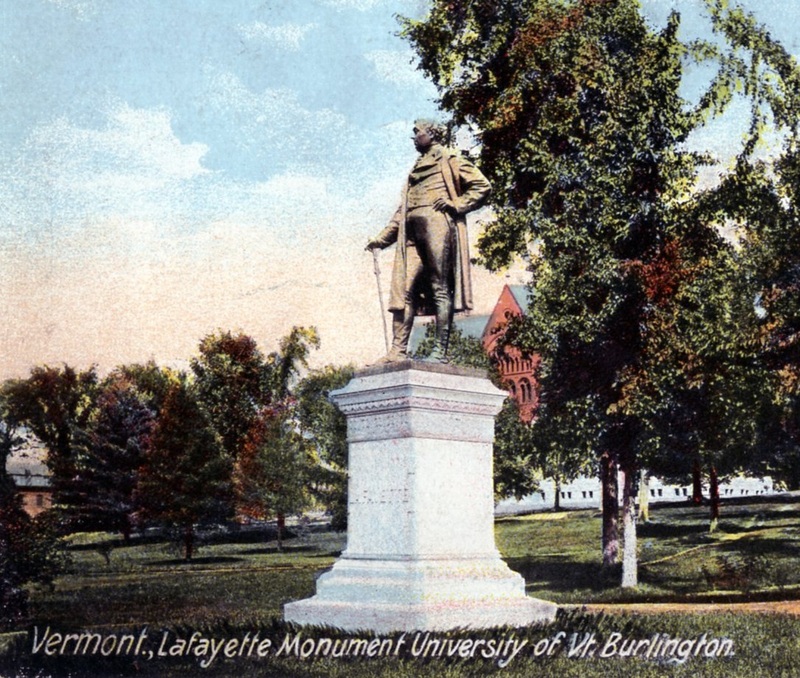 This entry was posted in Vermontiana and tagged Bastille Day, Burlington VT, City Hall Park., General Lafayette, L. L McAllister, Mayor J. Holmes Jackson. Bookmark the permalink. Among my Dad’s music I found a pamphlet entitled Everybody Sing. At the very top of this pamphlet written in cursive are the words, Burlington Club. It contains music published by Oliver Ditson Co. of Boston, MA. “Ditson’s Community Song Sheet. My Dad J. Amedee Tremblay attended the University for a short while. He graduated from Highgate High School in 1918. He also played the clarinet. I am wondering if he might have been at this 1918 Bastille Day Tribute in City Hall Park. We are of French Canadian heritage. This is a wonderful story with two great photos. The Burlington area had a very strong French community for most of the 20th century. I don’t think that there are any of the Francophone communities left in Chittenden County.